Wisdom teeth are the last teeth positioned in the upper and lower jaw. They are the last teeth to erupt in the mouth around the age of 18-21 years. In several individuals, the wisdom teeth are not visible because they have become impacted (stuck) under the gum tissue. Do all wisdom teeth require removal? When a wisdom tooth erupts easily through the tissue without compromising the neighbouring tooth, the wisdom tooth may be retained in the mouth with little concern as long as the person can brush, floss, and clean it thoroughly. Wisdom teeth are known to play up out of the blue, sometimes in the middle of the night. In that case, our emergency dentist may be able to attend to you. Give us a call on (03) 9374 2244. 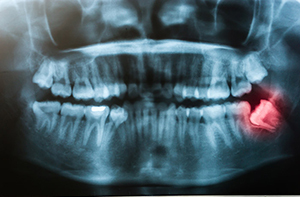 When does wisdom teeth need to be removed? Wisdom teeth are extracted when the tissue around your wisdom tooth is inflamed or infected. The symptoms of this infection are red, inflamed gum tissue behind the last visible molar, bad taste/smell, pain when biting on back teeth, and sometimes pus oozing and draining from the area. The wisdom tooth can also erupt at an angle such that the neighbouring molar can become difficult to keep clean. This complex positioning can cause decay to the adjacent tooth. If the third molar has erupted through the tissue but is without opposing teeth, extraction may still be considered. What can you do to avoid an infection? Regular brushing and flossing, using a kids toothbrush or small head toothbrush, help in preventing decay. Rinse after every meal and also rinse with warm salt water rinses to keep the area clean. Routine dental check-ups can help your dentist keep an eye on your wisdom teeth and let you know if they require treatment. Usually, the state of the wisdom teeth changes a considerable measure between the ages of 16 and 23. Thus it is critical that these teeth are inspected by a dental expert regularly to decide the correct diagnosis. Expert dentist at Niddrie Dental Clinic can assist you all the way through. Make an appointment with the dentist if your experiencing pain or discomfort from your wisdom tooth region. The Dentist will have a look and let you know your options. If he suggests to take them out, he will take a Xray (preferably a full mouth Xray) to see the position of your wisdom teeth. A general dentist performs most of the wisdom teeth extractions at our clinic. Sometimes you may be referred to a specialist in case of the complex positioning of the wisdom teeth. We are open for all holidays and weekends, so if you want to get your wisdom teeth removed during the holiday period, give us a call at (03) 9374 2244. At Niddrie Dental Clinic, we pride ourselves on offering quality dental care and variety of innovative treatment options to meet all your dental needs for you and your family. © 2015 Niddrie Dental, All Rights Reserved.